“Commander Steel along with “Red Rover” and “Dr. Destine” first appeared in Anglo-American Publications Co. Ltd. Grand Slam Comics vol. 3, no. 10, September 1944. According to Ed Furness, he was created by Les Gilpin, but it seems the initial inspiration came from a story from a U.S. writing pool. Furness remembered that he was a pretty successful character. This memory is supported by the fact that “Commander Steel” was usually the first story in Grand Slam Comics, and usually appeared on the cover. 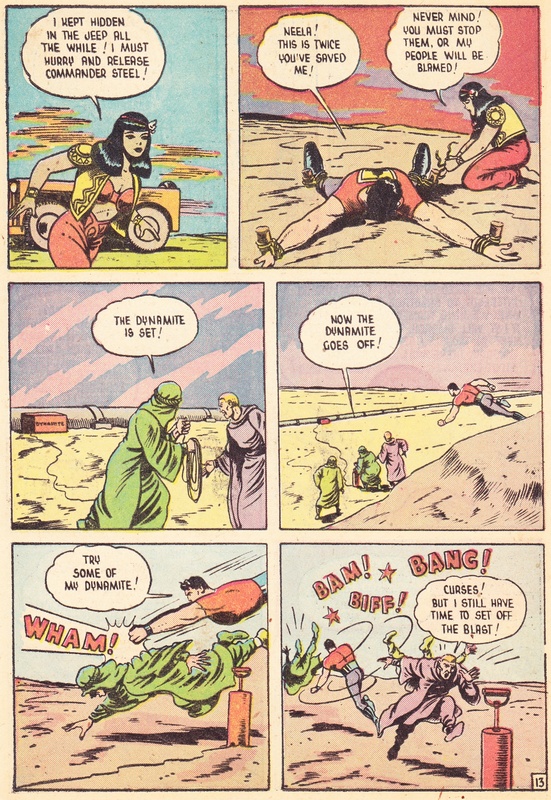 “Jack Steel of the American army was fatally wounded by a German shell at the battle of El Alamein but a strange little scientist took the dying soldier to his cave laboratory and gave him his amazing elixir of life Jack Steel then arose a new and powerful man with the strength of ten.” (Was Gilpin acknowledging a debt to “Captain Marvel” through a sly reference to Dr. Sivana? Certainly “Commander Steel” shows influences from “Captain Marvel”.) “…now playing a lone hand for the United Nations, unable to find the place of his birth or his true nationality Commander Steel fights for all nations of the earth.” It is interesting that like “Freelance”, “Commander Steel” has no past that links him to a place. Front: Illus., Unidentified. Grand Slam Comics. “Commander Steel …”. Contributors unidentified. Grand Slam Comics, Black and white interiors. “… The Ice Bombs Of Doom.”, 3-10, Sept.1944: 1-16. “… Battles Death On The Alcan Highway.” 3-11, October 1944: 3-16. “… in the Sinister Sargasso Sea.” 3-12, November 1944: 3-16. “… Robombs Over China.” 4-2, January 1945: 3-16. “… and the Synthetic Men.” 4-3, February 1945: 3-16. “… in the Bering Straits.” 4-4, March 1945: 19-27. “… The Fascist Fury.” 4-6: May 1945: 3-16. “… with the I.P.S. (International Police Service.” 4-6 (actually 4-7), June 1945: 3-16. 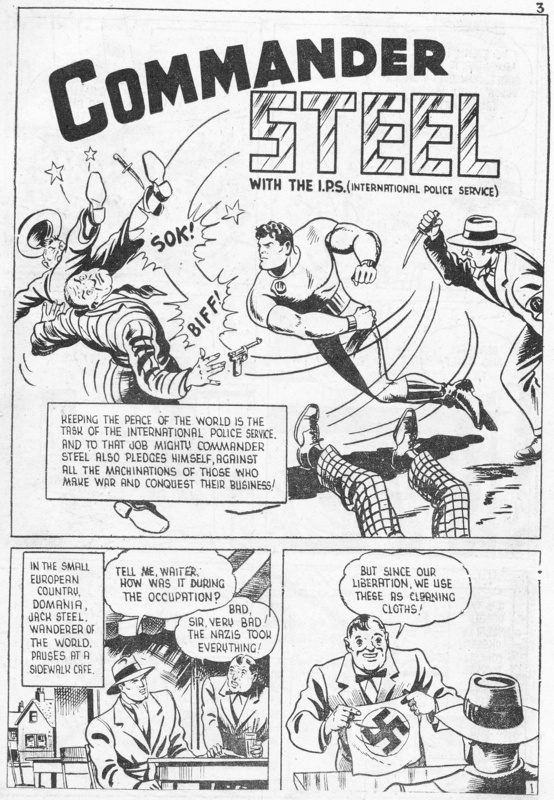 “Commander Steel of the International Police Force …” Contributors unidentified. Grand Slam/Three Aces Comics. Colour interiors. “Commander Steel of the International Police Force…” Contributors unidentified. Grand Slam, Colour interiors. “… and the Lost Legion.” V-51, February 1946: 23-32. “… and the Oil Plotters.” 5-54, August/September 1946: 2-15. “… and the Atomic Doom.” 5-55, October November 1946: 2-15. “… in Horror Hollow.” 5-55, October November 1946: 38-47. “… Borders Of Villainy.” 5-56, December/January 1946: 19-28. 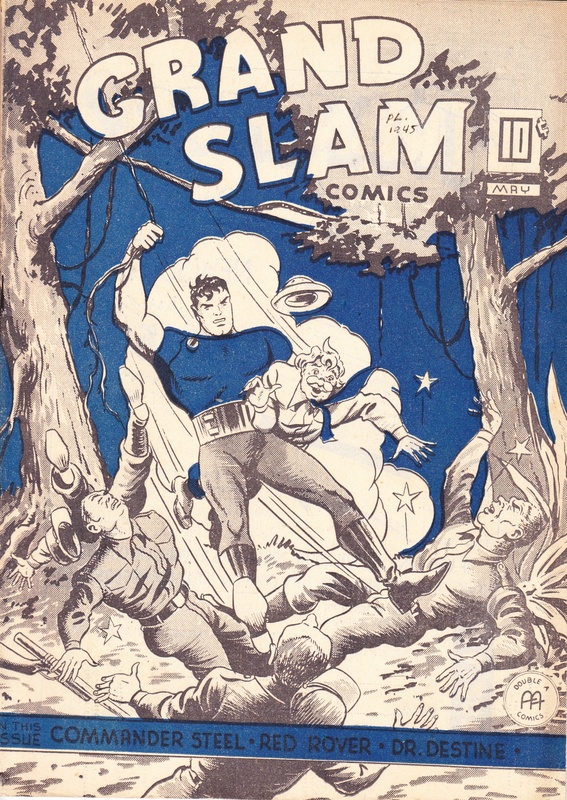 Grand Slam Comics, 4-6, May 1945: Front cover. 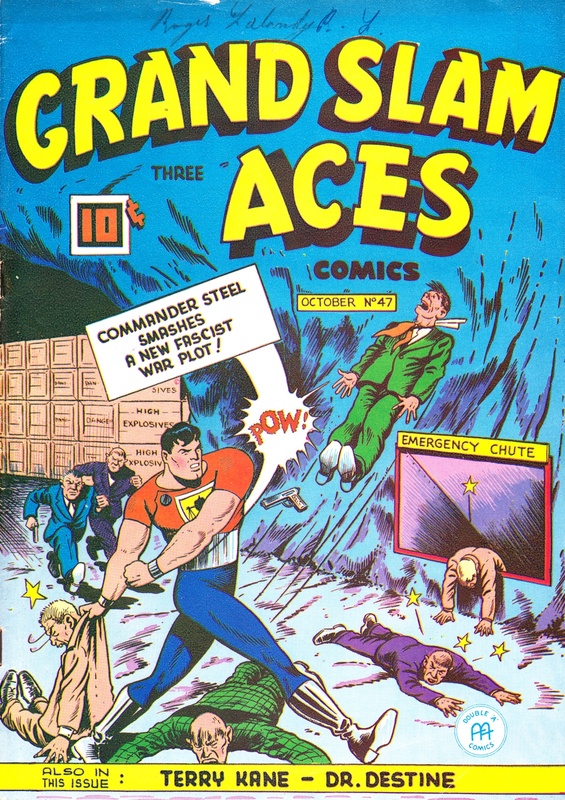 “Commander Steel Grand Slam/Three aces, IV-47, October 1945: Front cover.